Early Bird: SLEEP conditions lasts for half as long, rounding down. For example, half of three turns is 1.5, which rounds down to one turn. When the number of turns to sleep is one, half of this rounded down is zero, and the Pokémon wakes up instantly. [[Hidden]]Intimidate: Intimidate lowers the opponent's Attack stat by one stage upon entering the battle. It is triggered both when a battle begins and when a Pokémon with Intimidate switches into battle. Its believed that if you lock eyes with this pokemon its said that it can see into your soul. Its eerie howls send chills through the night. Must consume the Bones of the Deceased. 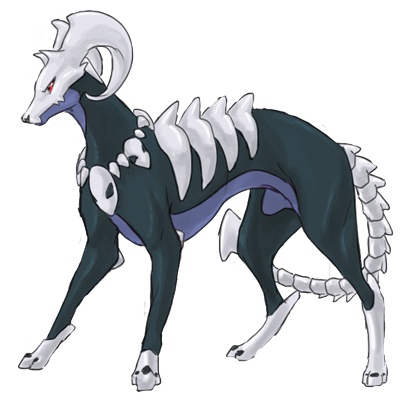 Houndemn keeps to itself, upon evolving it has become more protective of defending its pack. They are very hostile when defending their territory and pack that they will not even allow other packs of there kind to share the same area as them. They do not pay much mind to humans, but they keep a very close eye on them as they pass through, but very discretely that they have never been spotted very often. They mark their territory by leaving deep gashes in trees and rocks, believed to have been made with their large horns. 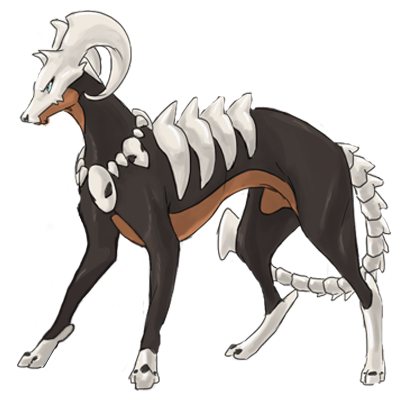 Male Houndemn drawn by Silverishness. 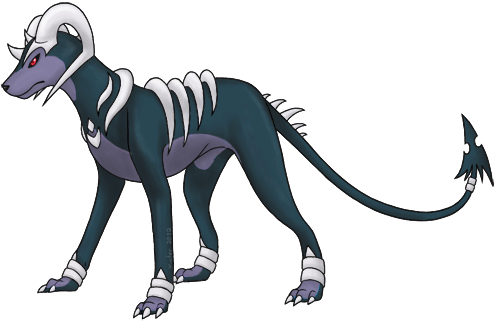 Female Houndusk and info belong to Winter.